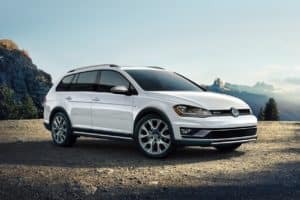 If the drivers in West Valley, Murray City, Orem, and the rest of Utah are looking for a cool car, then they don’t need to look any further than the 2018 Golf Alltrack. Sure, this wagon is powerful, fuel efficient, and colorful—but, above all else, it’s pure cool. Contact us at Volkswagen SouthTowne for more info! We’ll start with an overview of the wagon’s standard engine: the turbocharged 1.8L TSI powerplant. Not only does this thing generate up to 170 horsepower, but it can also deliver up to 199 lb-ft of torque. So, you’re all set to zoom around the city to your favorite coffee shop or race down the highway on a trip.But, in the 2018 Golf Alltrack, your adventures aren’t limited to just the types that you can have in the city or on the highway. No… This vehicle is full of performance-boosting systems designed for the trail. 4MOTION® All-Wheel Drive System. Between intelligently delivering torque to the wheels that need it most and working side-by-side with the Electronic Differential Lock, Volkswagen 4MOTION® is constantly active to keep you upright and on track. If you’re upright and on track, you’re good to go. Hill Descent Control. Steep, slippery grades tend to intimidate some drivers. Yet they don’t tend to intimidate drivers of the 2018 Volkswagen Golf Alltrack. Hill Descent Control makes sure of that one. Off-Road Mode. And, if those weren’t enough to convince you that you’re now prepared to venture off the road, then maybe this is… They literally have a button that configures the engine and the anti-lock brakes for you. It’s called Off-Road Mode, and we encourage you to flick it on when things get tough. And that’s without even mentioning this 2018 wagon’s paddle shifters, which you’ll find right near the steering wheel. These let you change gears without moving your hands from where they should be. Last, but certainly not least, the 2018 Golf Alltrack is one helluva bright car—so bright, in fact, that your friends, your family, and your significant other will immediately see you zooming up the road. With paintjob options like Night Blue Metallic, Deep Black Pearl, Silk Blue Metallic, Pure White, Tornado Red, Reflex Silver Metallic, and Platinum Gray Metallic, how couldn’t they? Contact us at Volkswagen SouthTowne to set up your test drive today. 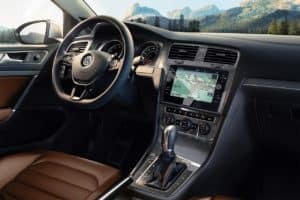 You could get behind the wheel of the 2018 VW Golf Alltrack within moments, regardless of whether you live in Orem, Murray City, West Valley, or anywhere else in Utah. Just contact our team now. 122 city/32 highway MPG (2017 Golf Alltrack 1.8L, 6-speed manual transmission). EPA estimates. Your mileage will vary and depends on several factors, including your driving habits and vehicle condition.